Beautiful stonebuilt old house of 19th century, just renovated, with roof terraces on three levels and a wonderful romantic courtyard with mosaic pebble floor.Free wireless high speed internet. The house is in a typically greek lively neighbourhood with sea view from 2 terraces. You can sunbathe totally private, on the double sunbed on the terrace, lounge on the second terrace, sleep on the roof terrace, all with stairs. or just wine and dine and bbq on the beautiful courtyard with stone pebbled floor (chochlakia, hand made one by one). 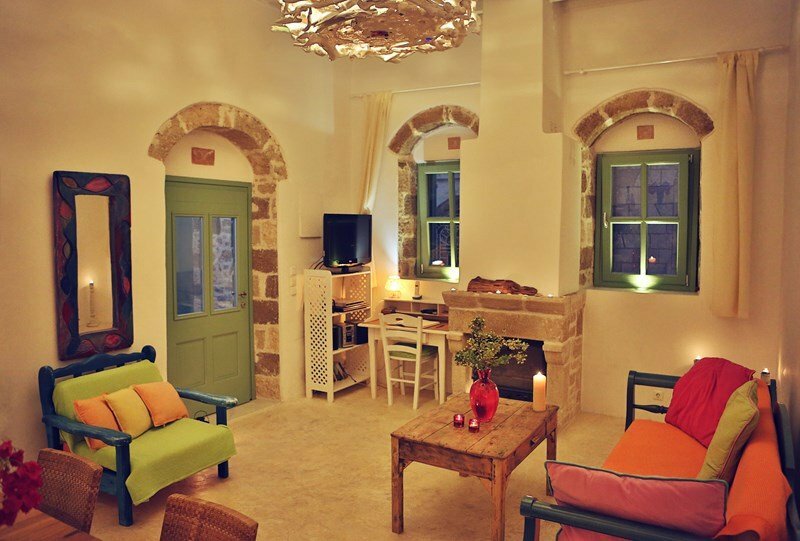 The Myrthia house is a very tastefully and colourfully designed house, all furniture are old and restored. lots of candles The village of Koskinou is a traditional one, with lovely friendly but initially distant greek people. for the rest there are artists from athens and some foreigners in a typically greek lively environment. grannys sitting outside and playing with their grandchildren. The Myrthia house is a happy combination of stone, wood and glass colours. 2 bedroom traditional village house with courtyard and romantic roof terrace with great views of the village and nearby sea. Short drive to beaches with crystal blue water. 15km to nearest golf course. Variety of village shops and tavernas nearby. 2km to supermarkets. Rhodes 15 min drive. Traditional village house set in Koskinou, a romantic village close to Rhodes Old Town. The house is newly renovated and great care has been taken to keep its original character with its mosaic floor. The house has been built to be private if wished, but in the midst of a very sweet and friendly neighbourhood. After having had holiday here, one can truly say that one had a Greek holiday, and not a typical touristic one. There is allways a friendly hello in the neighbourhood, and the old women gather around their courtyards and on the streets to watch their grandchildren, and gossip and laugh. A happy house to come home to after a day on the beach. ground floor patio: with dining table and a stting couch. 2nd level a built in b.b.q. and sink like an outside kitchen, with some chairs and a table. There is reachability from the top bedroom as from the outside stairs. 4th level, roof terrace where one can sleep and relax on the hanging bed. and a pergola on top. there are 2 secluded bedrooms, both with double beds. there is a sofa bed, that becomes a double bed, there is a folding bed, that we leave unfolded, but sleeps another person There can be placed 2 baby cots, There is free wireless high speed internet thoughout all the house. There is one courtyard, and 3 terraces all at different levels. There is an outside shower.